Looking for a travel trailer, but scared you’ll have to compromise a bed for more space? Well, worry no more. There are plenty of great travel trailers with Murphy beds out there. Murphy beds are excellent space savers. Think Transformers, but for beds. By day, it will be your cozy couch or storage area, but at night, it converts into a full-sized bed. This provides the perfect solution for saving space in campers, trailers, and RVs. 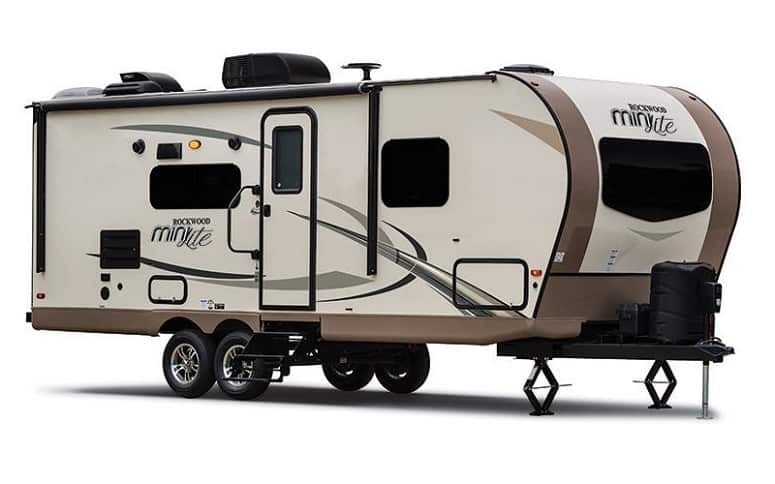 Of course, it can be tiring searching for the perfect trailer, so I’ve whipped up this list for you of the best seven travel trailers with Murphy beds. The Sonic SN200VML Travel Trailer 23-foot, 4-inch Sonic camper from Venture is a great space-saving investment. Relative to its size, it’s not the lightest out there, with a dry weight of 3,950 pounds. But when you look at its interior, you’ll know why. From the inside, you can slide out the side for a 64-inch sofa with a free-standing table. Further toward the front, you get another sofa, but with a little surprise. This is a 60-inch by 70-inch Murphy bed. Because this camper is excellent for small families, it has an accordion door between the bed and main living area—providing a sense of privacy. As you walk back toward the living area, you’ll notice the entertainment area is fully equipped. Across from the entertainment center is the kitchen. This space includes a microwave, refrigerator/freezer, and a double-burner cooktop fitted with a glass cover. To finish it off, there are seamless kitchen countertops where there’s plenty of space to get messy. The onboard bath is also fully equipped, with a toilet, sink, and a 34-inch shower. This shower is really something, sporting a radius glass door making it seem that much roomier. There’s also a medicine cabinet to help store any toiletries you’ve brought. Back outside, there is a one-piece seamless fiberglass roof. On the kitchen side, a 14-foot awning keeps you shaded. Toward the front, you’ll find pass-through storage on each side of the Murphy bed. 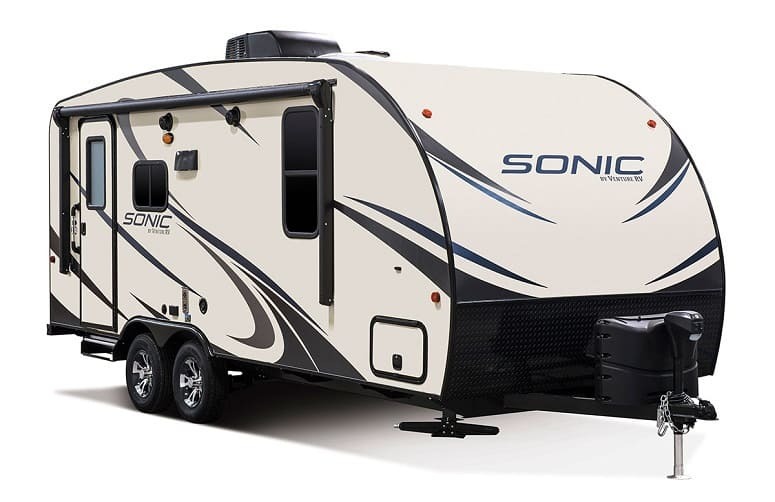 Check out this video review on the Sonic SN200VML Travel Trailer. 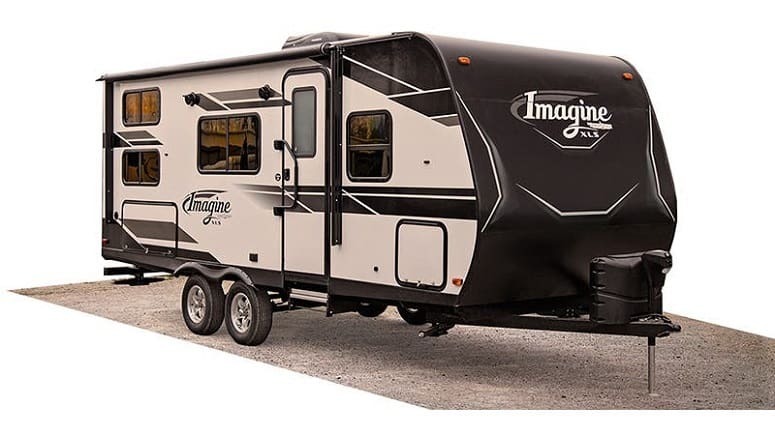 Now I know this is a toy hauler, which may not be for everyone, but hear me out. Jayco Octane Super Lite 312 Toy Hauler from Jayco hits the nail on the head. The trailer is 37 feet 11 inches long, including a 12-foot, 6-inch cargo area at the back. You may think I’m crazy. Yes, the cargo area is for toys, but it transforms into an additional sleeping, dining, or entertainment space. This means you have more place for family and friends. The extra room is separated from the main living area with a wall and a door. But after you open the 7-foot ramp, you can pull down a screen door—making for an open space, protected from any nearby flying insects. To be sure that this extra space is sleep-ready, they’ve outfitted the windows with blackout nightshades. This trailer is quite large compared to the Sonic above. It weighs in at 8,100 pounds with a cargo capacity of 3,660 pounds. The body itself is 102 inches wide, with no slide-out options. When you first enter the main area, you will find the bathroom. This is quite a roomy space, designed with an angled corner shower plus a linen closet. Here, there’s plenty of room to accommodate some extra people. Walking further toward the front, you enter the kitchen. This space has a two-burner cooktop, a convection microwave, and a double sink. There’s also a refrigerator plus freezer with spacious cabinets above. Across from the kitchen, you’ll see a dinette. Did I mention this trailer has room for more people? Well, this dinette transforms into a single bed. At the front of the camper, you’ll find the sought-after Murphy bed. During the day, this acts as a large sofa with large windows on each side. 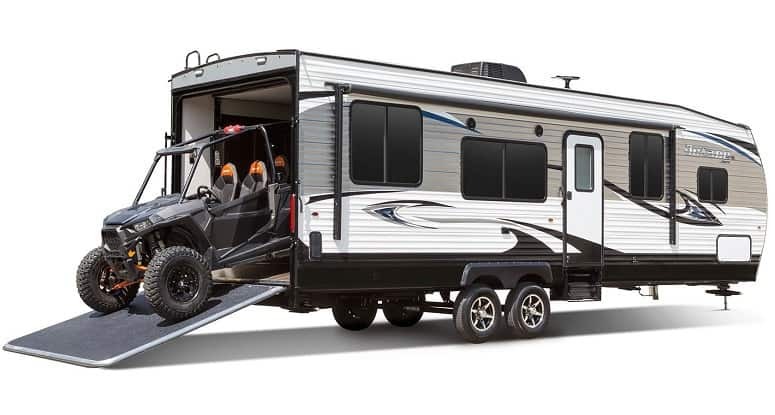 Take a tour of the Jayco Octane Super Lite 312 Toy Hauler here. If you’re into vintage vibes with all the modern amenities, then you’ll love this trailer! Gulf Stream Vintage Cruiser 19MBS is very basic to look at. There are no slides, no bunks, but a whole lot of 50s vibes. It has a considerable length of 23.1 feet, but what’s even better is its spacious height of nearly seven feet. At the front of the trailer, you have a jackknife sofa that converts into a large Murphy bed. It provides plenty of storage space with wardrobes on the sides, an overhead cabinet, and extra space under the bed. Walking back toward the rear, you will enter the kitchen area. Here you have a beautifully finished kitchen with wood grain panel designs. The cooking area packs a three-burner cooktop with an aluminum cover and a double sink. The kitchen is fully packed, sporting a refrigerator with a freezer and a microwave, as well as plenty of countertop space and additional drawers. Across from the cooking area sits the dinette under a large picture window. This diner-inspired dinette will make a comfortable bed for one. Entering the bathroom, you’re hit with more vintage vibes. However, you’ll be even more pleased once you see the corner-angled shower with glass door, which adds a nice modern twist. Behind the toilet is a large linen closet, and at the rear is a large window. Front pass-through storage, a spray port, and a full fiberglass-laminated shell and roof are on the outside. There’s also a power awning to provide some shade and extra outside space. I know, when you think of Coachmen, a Murphy bed isn’t exactly the first thing that comes to mind. But for this Apex Ultra Lite, they decided to try it—and what a bed it is! The couch/Murphy bed sits at the front of the trailer. It’s large, measuring 60 inches by 80 inches, so there’s plenty of room for long legs. At each side of the bed, there’s a closet to hang your finest clothes. What we love about Coachmen is the fact that the trailers are built for frequent use and high mileage. The trailer’s material is a blend of polypropylene and fiberglass. The result is a durable, yet lightweight, water-resistant exterior—Coachmen’s signature feature. With a length of 25 feet 6 inches, the camper has a dry weight of 4,472 pounds. Walking to the rear, your next stop is the kitchen. Now, this is where you get a sense of space! The kitchen has large peninsular countertops fitted with a three-burner cooktop plus oven. There is a double sink, microwave, and refrigerator with freezer. Above the countertop, you have a large overhead cabinet and pantry. The dining area across from the kitchen features a slide-out dinette with a large window. This can also transform into a single bed if needed. Walking further inside we get to the bathroom. Here you have a neo-angle shower with a skylight and power vent. 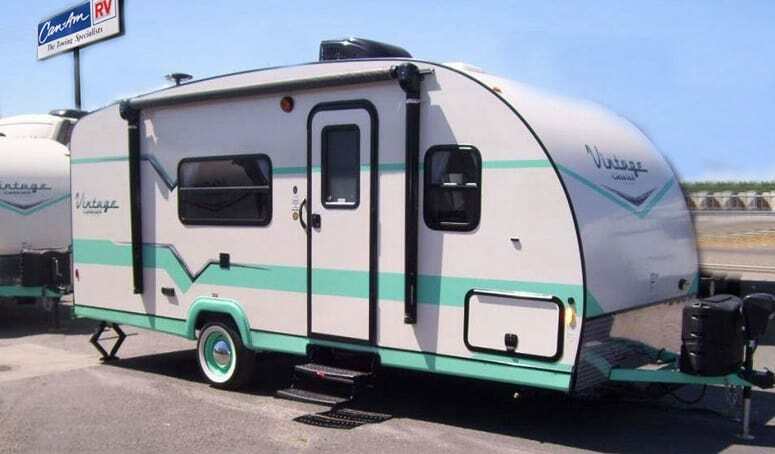 Forest River has made durable RVs and travel trailers for years, and this 2507s Mini Lite does not disappoint. The queen-sized Murphy bed situated at the front of the trailer becomes a comfy couch by day. This gives the trailer space for all the other accessories we tend to look for. When you fold down the Murphy bed, you get to enjoy the wonderful views from a large window. Although, this is only useful when you unfold the bed. By day, the large couch covers it up. At the sides of the bed, you get two wardrobe closets plus a nightstand on each side. The kitchen provides plenty of counter space, with a peninsula for a prep station. There is a three-burner cooktop with a microwave overhead. There is also a lean-in pantry and loads of overhead cabinet space. This camper also has a slide-out dinette fitted with carpets underneath. Additionally, there’s some extra storage space from the outside. This trailer really focuses on cooking. The outside features a swing-out stove plus a gas grill shaded under a 17-foot awning. The outside and inside connects with large windows, so you can easily keep track of your running toddler. Walking back indoors, the bathroom features a large, corner-angled shower cabin. The sink is at the rear end and has massive counter space with a linen closet above. 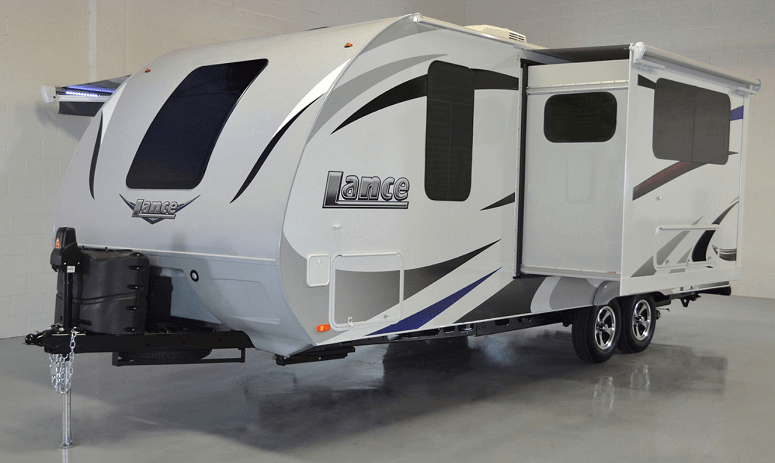 If your camper holidays usually include the family or your closest buddies, then the Lance 2185 is for you. It has a great length of 25 feet 8 inches, where up to seven people can sleep. At the front, you have a comfy couch that converts into a Murphy queen-sized bed. At the rear, you’ll find three beds stacked in bunks. These are child-friendly, but can easily fit an average adult. If there are fewer people, you can transform the bunks into storage space instead. You can also skip the large couch and order a walk-around queen-sized bed. You get tons of daylight with windows at the front and on each side. These do come with shades for when you want to relax your eyes. The kitchen is not as big as in the previous trailers mentioned. However, it’s still beautifully finished. The dinette is U-shaped—perfect for hosting a big gathering. It sits in a slide-out with three windows so you can enjoy the view. The bathroom has a roomy bath and a toilet, but the sink is on the outside. The idea of this trailer is that more people are onboard, so this little tweak allows people to freshen up, even when the bathroom is occupied. Jump here for a tour of the Lance 2185. Without a doubt, Grand Design Imagine XLS 19RLE is another quality manufacturer. Indeed, their designs are grand and include everything you need. This particular model is lightweight, yet fitted with all the amenities and finished with a touch of luxury. However, there are no slides or bunks, so you can’t bring as many people along. On the inside, your main attraction, the Murphy bed. During the day, this works as a large couch within the entertainment room with a swing out TV. At night, you’ve got it all in front of the bed, perfect for snuggling while enjoying a good movie. Around the bed are mirrored wardrobes. Now I love mirrors in campers, but they are unfortunately an underrated must-have for many. They open up the room and give you a spacious feeling. Next, onto the kitchen. Again this is not so large, but nothing is missing. There are roomy countertops with a three-burner cooktops, refrigerator, and microwave. Now, in the campers above, the dining area tends to be across the kitchen. Well, not here. At the rear end, you have a large U-shaped dinette, fit for a king’s feast. The bathroom, however, sits across from the kitchen. This, in some ways, makes it a bit more compact than usual. But you still have everything you need, with room to get around. There is plenty of counter space in the bathroom with an extra linen closet above. The shower is your typical Grand Design cabin, with room for two, if you’re into that. There are plenty of good travel trailers built with Murphy beds. This is probably one of the best features you can look for in a camper. It provides both a living and sleeping area without compromising the need for indoor space. What is your favorite camper with Murphy bed? Please let us know in the comments below. And, as always, share and like if you enjoyed our informative guide.